Although it was referred to in the press as the Kilroy & Morgan Block, and as a 6 storey brick office building, as far as we can tell the building on Granville 50 feet from the corner of Pacific Street was always a hotel – in 1912 the Bayview Hotel. Granville Street veterans Parr and Fee designed the building, as they did on many other lots to the north. This project was valued at $100,000, suggesting Kilroy and Morgan were pretty successful, and it was built by J J Dissette. In 1911, the year the building was constructed, William Kilroy and Frederick W Morgan ran a gentlemen’s clothing store at 37 Hastings Street, and while Mr Kilroy lived in rooms at the Hotel Vancouver, was aged 35 and claimed to be retired, Mr Morgan (who was only 31 years old) lived with his wife, Jenny, and two sons at 1165 Comox Street. It looks like he came from Quebec, while Mr Kilroy may have come from New Brunswick (but the census clerk badly needed a new nib for his pen). The hotel opened as the Bayview in 1912, with Sarah Cusick as the manager, her sister worked there and it looks like her brother, Norman lived there too (Norman was manager of BC Colonization Co). Norman and Albert Cusick were in the city in 1910 – Albert made candy for Livingstone & Co, while Norman was a clerk in David spencer’s store and they lived on Howe Street. Albert isn’t listed in 1912. In 1913 Sarah is still at the hotel, and Helena Cusick is working and living there too, but Norman is now a salesman with Western Farming and Colonization Co and has moved up Granville Street. A year later all this Cusick family have left town, but Lena Cusick is managing the Bon Accord Rooms on Hornby. No name is associated with managing the hotel, which seems to have become the Bayview Rooms, with three staff. Kilroy and Morgan had plans for another even more expensive building in 1912 – a six-storey building received a permit for a Hastings Street location, designed by Braunton and Leibert. But the economy collapsed and the project was never built. In 1913 they bought the Maple Leaf Theatre on Granville Street with a plan to add two floors of commercial space, or apartments. That didn’t happen either – in 1936 it was rebuilt as the Plaza, (today’s Venue). In the 1920s the Hotel changed to the Continental, which is the name it had in our 1932 image, (and that’s the McCulloch Motor Co in the foreground). It’s still a name it holds today, and it still offers rooms as a single room occupancy hotel, but not for much longer as it’s planned that the tired and compromised building (since the Granville Bridge was built in the 1950s) will soon be replaced. The loss won’t be the hotel (as the city bought a more recently built hotel to re-house the residents – and that building has bathrooms). It will be the mural of whales, painted by Wyland in 1994 and restored in 2010. There may have been a war on, but that didn’t seem to slow the rapid growth of Vancouver’s prestigious ‘auto row’ – the southern end of Granville Street near the Granville Bridge. 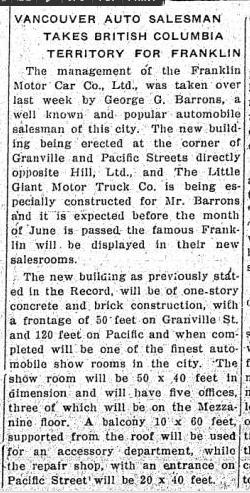 In 1917 a new garage was built as a salesroom for the Little Giant Motor Truck Co on the north-east corner of Pacific and Granville. A year later another showroom was built immediately opposite, this time for F T Andrews and designed by Robert Matheson, a year before he went into partnership with Fred Townley. Bedford Davidson won the contract to construct the building, imaginatively named ‘The Garage Building’. Reo Speedwagons could be seen a couple of doors up the street just past the Bayview Rooms, a hotel designed by Parr and Fee in 1911. It soon became apparent that the garage was for George G Barrons who was going to sell the Franklin automobile. This was a luxury vehicle, manufactured in Syracuse, New York. The Franklin was popular with doctors as it was very reliable, being air-cooled (and so unlikely to be frozen up in the middle of the night). It also had extensive use of aluminum in the body, and some models offered better gas mileage than many vehicles today (over 32 mpg). Before the show room opened a new owner was announced; W O Webster, the sales representative for Canadian auto builder Gray-Dort announced he would be taking over the Franklin agency and adding Mitchell, Lexington and Premier brands as well. The Mitchell came from Racine, Wisconsin; the Lexington from Connersville, Indiana and the Premier from Indianapolis, and was one of the few other companies (like Franklin) to air cool their engine. As the photograph shows, Gray-Dort were the main brand, and they were shipped from Hamilton, Ontario. The company folded in 1923 when the US designer J Dallas Dort decided to retire, and the Canadian builder couldn’t persuade him to stay in business. 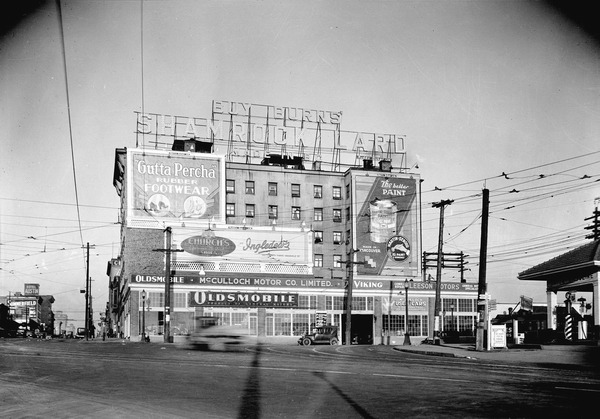 The garage in the late 20s and early 30 was the McCulloch Motor Co and had switched to selling Oldsmobiles, using the Continental Hotel (as the Bayview had become) as a giant billboard. The depression saw car sales plummet and In 1935 the garage was empty. Curtis Motors had moved in by 1939, (although they didn’t stay long and in 1950 they were selling Hillman cars a little further up the street). 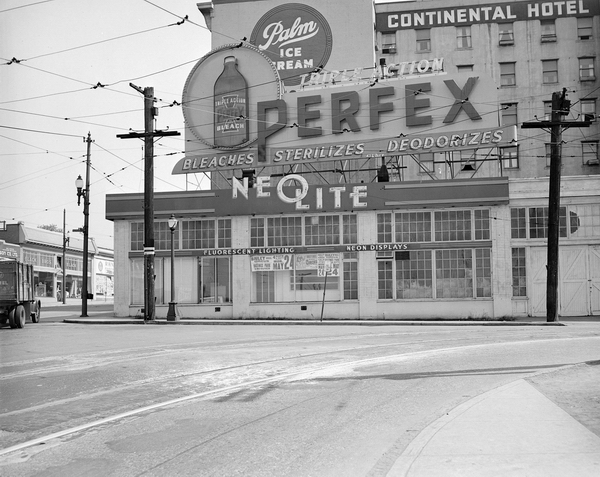 The last company in the building were Neolite who made neon signs. they were there from the early 1940s until the early 1950s. And then in 1953 they built a new Granville Bridge. Across the street from the Mahon family the Townley’s had their home. This house was the home of J D Townley, often described as the Assistant Superintendent of the Canadian Pacific Railway. The earliest we can trace his residence in Vancouver to is 1887, when he was described as the accountant of the Pacific division. We also find him here in 1888 in a series of financial transactions in conjunction with the completion of the railway and the purchase of lumber ties. Those papers make it clear that more accurately he should be described as the Assistant to the General Superintendent, Henry Abbott, whose later home was built nearby in 1897 on Georgia Street, but who lived on Hastings in 1887. We don’t know exactly when the house that Mr Townley lived in was built, but we know he was living here by 1889 at 944 Hastings. In 1881 James had been living in York outside Toronto in Ontario with his mother, Alice, aged 52 and two younger brothers, Thomas and Robert and a sister, Rose. He was aged 22 and a station master. Robert Townley aged 20 also worked for the railway. All the children at home were born in Ontario, although Alice was from England. We can trace the family back ten years: the family were still in Ontario. James was 12, all three of his younger siblings were there, there is an older brother, John, aged 16 and an older sister, Lilly and his mother was recorded as being aged 37 (although she was probably 41). Ten years earlier than that, in 1861, the census finally reveals the name of James’s father to be John, a sailor born in England. Alice was 31, and as well as John and Lilly there are four older siblings, all born in England; Richard (11) Margaret (13), Elizabeth (15) and Ann (17). There’s also a younger brother, Charles. By the 1891 census James is shown as aged 29 and Assistant superintendent of the CPR. 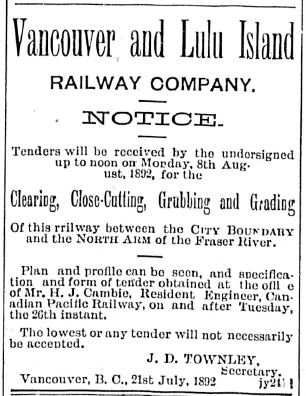 In 1892 as the advertisement shows he was secretary of the Vancouver and Lulu Island Railway – a spur line, technically not owned by the CPR until 1902. Soon after 1903 Charles married Alice Ashcroft (a writer with the same first name as his mother). In the 1906 directory none of the Townleys are listed, but in 1908 Charles is living in the house on Hastings again (presumably with Alice). His mother and J D Townley are apparently no longer to be found in the city. Charles has a new business partner, he’s now Walker and Townley, and he is a Justice of the Peace. 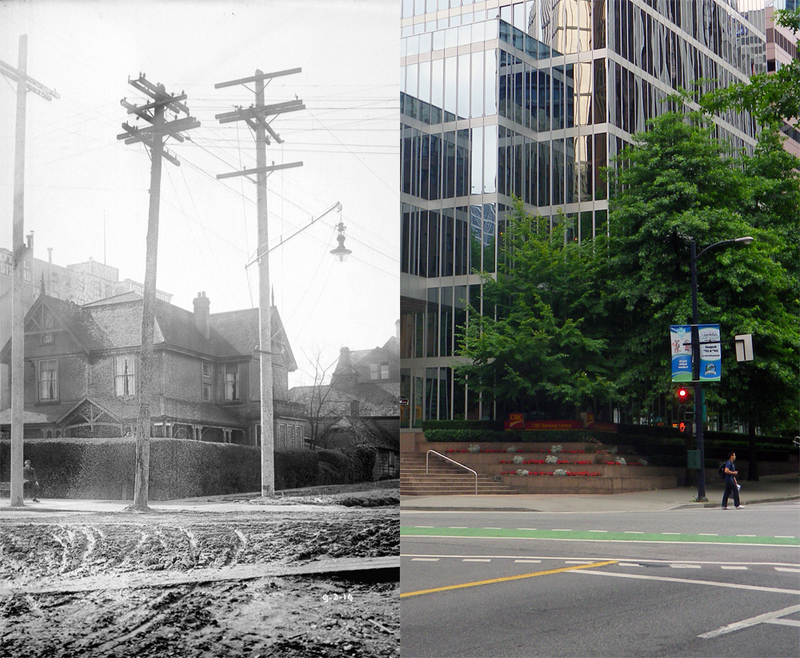 In 1911 he’s still living there, but now doing business as Townley & Keefer. The Census that year shows that after many years of relative quiet, the household is now positively buzzing. Charles and Alice head the house, Ethel and L W Herchmer are lodgers, with their baby daughter Laurentia, and a 9-year-old nephew, Randall Laurence. There’s a nurse, a 12-year-old maid, a Chinese servant, and last but not least Alice senior, now 81. There’s no suggestion that James is still alive in 1911 – if so it was not in Canada (unless the Census missed him). Ethel Herchmer (not Edith as the press reported) was aged 28 (although she was probably 31), and her husband L W was recorded as being 64 – quite the gap, but actually even greater as L W Herchmer was really aged 71. He was born in 1840 in Shipton-on-Cherwell, England and had an extraordinary career, arriving in Canada to attend school in Toronto, returned to Military College in England and aged 17 he acquired a commission and served in India and Ireland. In 1862 he sold his commission, returned to Kingston and became a farmer before taking a job as supply officer to the boundary commission of 1872, setting the Canada / US Border. He married in 1864 and had at least four children. He ran a brewery in Winnipeg before becoming Indian Agent in Manitoba and in 1885 he was promoted to inspector of Indian agencies for the North-West Territories. In 1886 Sir John A. Macdonald selected Herchmer as commissioner of the North-West Mounted Police. Herchmer dealt with a huge range of problems, and created a highly efficient organization (and a few political enemies in the process). Accused of mistreating his men and mis-using government funds, an internal departmental investigation cleared him. However, Herchmer found himself caught between governments cutting back on expenditure and manpower and a public demanding increased services. A change of government saw him even more isolated, his wife died in 1899, and an episode during the South African War (in which he had volunteered in early 1900) saw the prime minister decide that Herchmer was being unreasonable, had in fact been insubordinate, and was therefore no longer fit to command the NWMP, and he retired him to pension on 1 Aug. 1900. 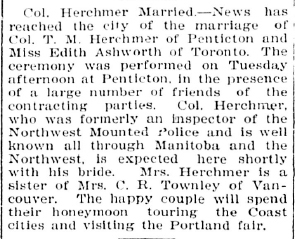 In 1905 Colonel Herchmer married again, as the press cutting (sort of) shows. For once the British Colonist got the details of the wedding wrong; there were two weddings involving a Lawrence Herchmer that year. Lawrence Herchmer, of Winnipeg, married Edith MacDonald of Ontario in Fernie. This Lawrence was L W Herchmer’s son, and was apparently usually known as Sherwood (one of his middle names). He almost certainly wasn’t in the NWMP, and Edith wasn’t related to Alice Townley. Lawrence (the son) died in Greenwood in 1933 aged 66. How LW Herchmer met his second wife we don’t know, although they would seem to have settled in Victoria around 1906 and moving in with his wife’s family a few years later. The couple owned property in Victoria (somebody moved their fence – and the sidewalk – in 1908), and they were living in rooms at ‘Roccabella’ on Quadra Street. (The City of Victoria denied any involvement in the mysterious realignment). There’s no suggestion that the Herchmers moved out of 944 Hastings after 1911, but there’s no confirmation that they were there either. In 1914 there were new power poles installed outside the house, worthy of recording in a photograph. (Either the work made a mess of the street, or paving still hadn’t reached this part of town, even by 1914). L W Herchmer died in Vancouver in 1915 aged 74, his widow in 1968 in North Vancouver. In 1926 and 1927 Ethel was living in an apartment on Thurlow Street with her sister, Alice. In 1928 they were living in a newly built house at 1177 W 33rd Avenue, and a decade later they were still there and her daughter Laurentia was also living with them. 1916 is the last reference to Charles Townley living at 944 Hastings. A year later Mrs Fletcher was living there. Perhaps Charles joined up, and on his return they left the city. In 1919 Charles was shown to living on Savary Island, a location he had earlier bought and subdivided in his brokerage days. His wife, Alice, was increasingly active in a variety of areas of city life. In 1912 she founded the British Columbia Equal Franchise Association, of which she was president until 1917. In 1918, she was president of the League of Women Voters, a post she held again in 1932. In 1929, she was elected as the first female commissioner of the Vancouver Parks Board, a post she held until 1935, a role now commemorated with a park named after her on E 2nd Avenue. She was also a successful writer; she apparently wrote for a Toronto newspaper before her marriage and she published several books, both fiction and non-fiction. She died in 1941. By 1925 the Townley House was gone, and soon after a service station appeared on the site run by Thompson and Graham. In 1984 Waisman Dewar Grout Carter designed the building that’s there today, an unusually silver reflective office building called Commerce Place (home to the CIBC Bank in town) that reflects the view of the Marine Building across the street. This image is labelled in the archives as “old house, Burrard and Hastings Sts, Jan 1929”. We’ve identified it as the Mahon House, home to Edward Mahon for many years, and very soon after this it was demolished and replaced by the Marine Building. For much of its life it was addressed as Seaton Street, the name for this stretch of Hastings. We weren’t sure who designed the house, but we now know it was W T Dalton who retained a relationship with the Mahons for many years, and it appeared in 1898. (A year earlier Edward Mahon was living at 825 Howe Street). Joseph W McFarland, an Ontario-born early investor in Vancouver took credit for creating the brokerage company of Mahon, McFarland and Mahon in 1894. He had been involved in the formation of Vancouver’s water company and the Electric Light company (with David Oppenheimer) in 1886, and a real-estate, insurance and stock company in 1892. That company added Edward Mahon two years later and Gilbert Mahon (his younger brother) in 1895. Edward and Gilbert Mahon were the sons of an Anglo-Irish father, Rev. Sir William R. Mahon and his wife Jane. Sir William was 4th Baronet of Castlegar, County Galway, Ireland, and Edward, the sixth child was born in 1862 (in Yorkshire where his father was an Anglican minister) with Gilbert (the eighth) arriving three years later. The Mahon’s were from a family with money. Guinness Mahon was a Dublin-based land agency that soon after their mid 19th century creation became a merchant bank. Edward Mahon was already in town, and active in development before joining McFarland. In 1894 he was one of three people to put up $100,000 to found the Granville Club, a business social club where his co-founders were Henry Bell-Ogle and David Oppenheimer. That year he was listed as living at the Hotel Vancouver, although he soon moved to Howe Street. In 1895 both Gilbert and Edward were involved in creating a mining syndicate, and Gilbert was also living in Vancouver. Gilbert obviously raised finances in London for the “Jewel Mine” at Long Lake Camp. An 1898 Minster of Mines report noted “Work has been resumed on the Jewel, in Long Lake Camp, lately Jewel acquired by the Jewel Development Syndicate, which has organised a Mineral Claim, a short time ago in London, England, by Mr. Gilbert Mahon, of Vancouver. The Jewel had an incline shaft sunk about 170 feet prior ‘to the suspension of work, which took place early in 1898. About 220 feet of drifting at the 120-foot level was also done at the same time. The first steam mining plant brought into the district was installed at the Jewel early in 1897. It consisted of a 15 h.p. boiler, 6 h.p. hoist, and a steam pump. The Jewel last year enjoyed the further distinction of having the best timbered and, from the miner’s point of view, safest shaft in the district. Its quartz vein has been irregular in value, although maintaining well its size. It is anticipated that, under the new auspices, more settled country will be reached, and better general values be obtained.” The 1897 Vancouver street directory shows Gilbert living in Rossland. This wasn’t Edward’s first foray into mining – Edward Mahon came to BC in 1890, using family money to invest in mining sites in the area. His older brother, John Fitzgerald Mahon came in 1889, and upon his return to the UK he convinced Edward to emigrate and act on his behalf. Initially he didn’t do a great deal of actual mining, but bought and sold properties. In 1891 he purchased 320 acres on the west side of the Columbia and had it platted for a townsite in 1897. He gave mineral names to the streets, ie, Silver, Galena, Iron etc. He named the area after his home in Ireland, Castlegar, but “was frustrated in the fulfilment of his vision by unfavourable developments that were orchestrated by the Canadian Pacific Railway” (according to his biographer, Walter Volovsek in ‘The Green Necklace: The Vision Quest of Edward Mahon’). 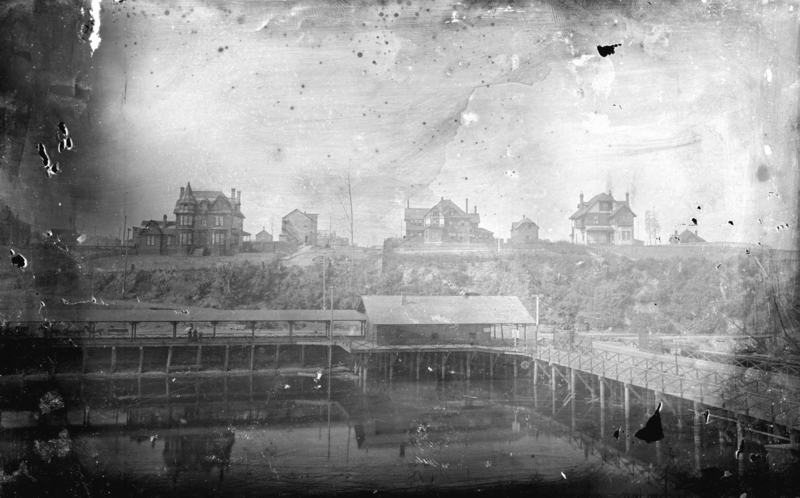 Gilbert had been active in Vancouver as well as he acquired George Black’s Water Street property in 1896 (lot 12 of block 1 in the Old Granville Townsite). It took him a further five years to get the Provincial Government to give him clear title to the property. 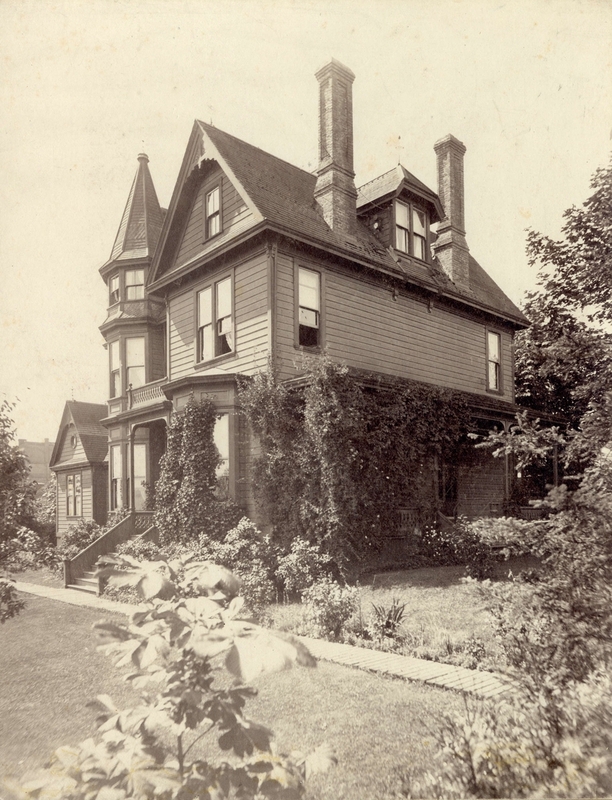 In 1896 he was shown as living at 813 Georgia Street (near Howe) while Edward was at 825 Howe. He gravitated more to the Kootenay district towards the end of the decade, but by 1902 he had had enough of the mining business. The distribution of a legacy (the King Legacy) gave him the funds required to settle back in England with his wife Fanny. Poor investments saw a dissipation of his fortune. He returned to Vancouver with Fanny in 1907 to visit Edward, checking out Rossland and Greenwood enroute. Mahon McFarland and Mahon owned a series of investment properties in the city, as well as acting as financial brokers and agents for the North British and Mercantile Insurance Co. Other property was held by John F Mahon, and some by Edward. Joseph McFarland remained president of Mahon, McFarland and Mahon until 1911 when it was sold to London & British North America Company, Limited, one of the largest and strongest financial institutions in Canada. The renamed Mahon McFarland and Procter seem to suggest Frederick Procter, an English broker who arrived in 1895 replaced Gilbert Mahon. Gilbert had apparently moved to Rossland by 1901 where he expanded the mining interests significantly in the early 1900s, and by 1907 it was reported that he had sold the Jewel Mine and returned to Ireland, although he visited mining prospects in BC at least once in 1907, and apparently retained an active interest in the mine, as he selected the location for the new cyanide plant in 1909 (suggesting the Jewel was still producing valuable ore). By 1913 Edward Mahon was resident at 323 Burrard St, Vancouver. Clubs: Vancouver; Union (Victoria); University (Dublin). He had been married in 1911 to Lilette Caroline Julia Rebbeck, daughter of James K. Rebbeck and Elizabeth l’Abbadie, and in 1913 his son, Bryan was born. Elizabeth was a widow after the death of James from esophageal cancer in 1910. As a published record notes, “Edward encountered a few hurdles in his courtship of Lilette: firstly, she lived in Victoria; secondly, her mother, Elizabeth Rebbeck, was opposed to their relationship. Yet this was somewhat understandable given that Edward was 29 years older than Lilette – he was 48 and she was 19! But being a savvy businessman, Edward solved his problems by offering a managerial position at Capilano Suspension Bridge to Elizabeth. She couldn’t turn down such an opportunity and quickly moved to Capilano, accompanied by her lovely daughter Lilette. Needless to say, Edward and Lilette were married one year later . The North Vancouver Land and Improvement Company was the foremost among the real estate companies in the early years of North Vancouver. The greater part of the company’s lands were surveyed for settlement in 1896, and in 1897 and 1898 the first five families moved in. In 1908 the company commenced clearing on Grand Boulevard. In 1910 the Capilano Bridge property was acquired, giving Edward the opportunity to offer his mother-in-law-to-be a position. In 1914, the company was restructured and incorporated, with John Mahon being a major shareholder. John Mahon had one child, a son, (John) Denis, who was a highly distinguished collector of Italian Art and an international expert on the topic, acting for many years as a Trustee of the National Gallery in London. Sir Denis died in 2011 aged 100 and left his personal collection of multi-million dollars worth of painting on loan to a number of International Galleries on the understanding that they can never charge admission to see them. Two other Mahon cousins, Ross and Henry Mahon established their homes on Saltspring Island in the 1880s, established themselves in the lumber industry and financed the construction of the community hall, Mahon Hall, in Ganges in 1904. Thanks to Walter Volovsek for details of the Mahon family: see the Facebook page linked from his website for more on the family. Dr John Lefevre was a city pioneer – he was one of the really early residents who arrived before it was a city. He was from Ontario, born either in Brockville or Belleville, and trained as a doctor at McGill University in Montreal. He practiced as a doctor in Brockville, was elected to the Town Council there, but almost immediately gave up his seat to take a new job with the Canadian Pacific Railway as surgeon for the Pacific Division. He arrived in Granville (the pre-Vancouver township) early in 1886 and set up his office above James Hartney’s store just off Maple Tree Square. Like everybody else he must have lost everything in the fire that destroyed the city, but he had already set up a hospital at the foot of Hawks Street on Powell. There’s no record of how Dr Lefevre survived the fire, but he soon had a wooden hospital in place (a CPR rather than a city enterprise). His wife, Lily, joined him 2 weeks after the fire, arriving on a train consisting of superintendent Abbot’s private railcar as far as Port Moody (before the arrival of the first official train) and then by boat as the rails hadn’t yet been completed into the city. Six weeks after Lily arrived Dr Lefevre had built a cottage on Hastings Street, (on the north side between Seymour and Granville) In 1888 he was shown to be living on Cordova Street with offices on Cambie and in 1889 on Granville, on the corner of Cordova. There was a bit of confusion, as he’s shown in a different directory as living at Howe, corner of Cordova, but Mrs Lefevre talked to Major Matthews, and she was clear it was on the north-west corner of Hastings and Granville – over the cliff. However, checking the map it’s apparent that the directory was correct and Mrs Lefevre was right about the general location (and theirs was the only house on the block) but the actual corner was on Cordova (as it would have to be to overlook the cliff). This is the house in the picture; way out of the old Granville township on the CPR’s land to the west. It was located high on a bluff with the cliff down to the beach and the first CPR station behind it. Here’s a picture of the house from beyond the station sitting high up – it’s the big house on the left of the image. We don’t know who designed it, but there were relatively few architects in the city at that time. By December of 1886 Dr Lefevre had been elected an alderman of the city, and was an active member of council, involved in establishing parks and getting services to the new city. He was also an enthusiastic purchaser of land; Walter Graveley in conversation with Major Matthews in 1935 recalled the first sale of CPR lots “Ferguson had his hand on the handle of the door; Ferguson was first; Dr. LeFevre was second; F.C. Innes was third; then came R.G. Tatlow; C.D. Rand was next, and I was behind C.D. Rand. The first three, Ferguson, Dr. LeFevre, and Innes had sat up all night in Ferguson’s office in the same block; the Ferguson Block was the wooden block on the corner of Carrall and Powell streets, where the C.P.R. had their first offices in Vancouver; we were waiting for the C.P.R. office to open; that was why we were there; there was no rush; we just walked in when the office opened that morning; Ferguson was first; he had his hand on the handle of the door.” Ferguson built a house at around the same period as the Lefevres on the same bluff, a little further along Hastings. In 1890 Dr Lefevre built the commercial block bearing his name on Hastings Street designed by C O Wickenden. His house now had established gardens, as this picture from 1890 shows. He acquired an interest in the failed telephone company in 1886 and helped it achieve considerable success over the next 12 years when he arranged its sale to the Yorkshire Guarantee and Security Company. (It was suggested he threatened to establish a rival service if he wasn’t given control in the early days of the company). He stayed a director, reacquired the company (with others) in 1902, and by 1906 was the leading shareholder with William Farrell who ran the company, now known as the BC Telephone Company. Dr Lefevre also had significant investments in the new railway company who provided transportation in the rapidly growing city. He supported the idea of a tram in 1888, initially built as a horse-pulled system but quickly changed to electric as more capital was raised. Dr Lefevre’s father-in-law was in charge of the company. The railway amalgamated with the electric light company and new equipment was installed to power both systems. The first tram ran in 1890, but the system ran at a loss, although other investors (including David Oppenheimer) seem to have taken their losses harder. While retaining his medical practice, holding council office and managing his business interests Dr Lefevre also found time to become president of the Vancouver Board of Trade. The Lefevre’s sold their house for $20,000 (if Mrs Lefevre’s memory was accurate) – presumably to the federal government who assembled three-quarters of the block and built three buildings over a number of years, starting with the Post Office in 1911. That sale would seem to have been around 1901; that year 1901 Dr Lefevre is shown as living at 1123 Barclay and from 1902 to 1906 at 1300 Howe Street. It must also have been unplanned, as in 1901 W T Dalton designed a $3,500 addition for the house built by Crowe and Wilson (although perhaps it wasn’t even completed). From 1911 to 1913 the Customs Examining Warehouse was built where the house used to stand, designed by David Ewart, Chief Architect of the Department of Public Works. Although it looks as if it was built of brick, it actually has a steel frame with a reinforced concrete structure; a modern construction technique unique among Vancouver’s warehouses at the time. In 1983 the complex of four buildings became the Sinclair Centre with a glazed atrium covering the gaps and lane, designed by Henriquez Architects. Dr Lefevre died in 1906 when he was in his early 50s. Lily Lefevre had McClure and Fox design a new house at Marine Drive in 1915, and lived in the city for over twenty more years, dying in 1938 aged 85. As a wealthy, childless widow after her husband’s death, Lily became a patron of the arts in Vancouver, helped found the Vancouver Art Gallery, and made her home, “Langaravine” a local gathering spot for writers, painters and academics. Her circle included poets, the editor of the Vancouver Sun and architects. She won $100 for the best poem with reference to the first Montreal Winter Carnival. She also wrote lyrics which may have been set to music, publishing three volumes of verse, and painted watercolours. Here’s 918 Hornby from Heather Lapierre’s family album picture of her great-grandfather and family (many thanks for the image Heather). The image dates from 1893, the year the Thicke family arrived in Vancouver. Walter and Clara Thicke were from England, but had been in Ontario since at least 1881, as they were living in Ottawa that year – then Clara is listed as Anny Clara (although she was really Clara Annie). The 1891 census shows they had four children in the next decade, Walter, Claude, Violet and Harold aged from nine down to one. That year Walter was a clerk in the registry office and Clara a music teacher. They were living in New Edinburgh, a suburb of Ottawa. Once they arrived in Vancouver there were five children; in the photo there is an additional child, Marjorie, born the year after the 1891 census, also in Ontario. She is the child in Clara’s arms. Heather identified the people in the picture, from left to right they are Harold, Walter Sr., Clara, Marjorie, Claude, Violet and Walter Jr. Clara retained a musical interest in her new home city – she was a soloist at Christ Church Cathedral. The block the family lived on initially developed slowly. Eight years after they moved in (in 1901) there was a house next door, but then four vacant lots to the north and just one small structure at the back of one lot of six lots to the south – but by then the family had moved on. That year they were living at 1138 Robson, where Walter senior was a notary public and Walter junior was a clerk with the Canadian Pacific Railway. Claude was also working for the CPR. They had moved away from Hornby even earlier; in 1896 Walter was listed at having moved that year to 1026 Haro and he was the deputy registrar at the Supreme and County Courts as well as Registrar of Marriages at the Law Courts. After 1901 the block was built out quite quickly – it was almost all houses, and only one lot was left undeveloped by 1912. By then the house had long been renumbered as 940 Hornby, and Mrs M A Howard was living there (the Howard family had been in the house for some years, and Mrs Howard was a widow at this point). Her husband, James was partner with John Ross in Ross & Howard, one of the city’s ironworks. (You can see their name on the cast bases of the Chinatown lamp standards). Mrs Howard stayed until after 1920, and a series of new owners (or tenants) seem to have lived in the house until at least 1950. There are few pictures of this street through this period, but the street Directories show that while a number of commercial uses appeared, several addresses on the block were still homes. Clearance for the proposed Provincial complex started in the mid 1950s; the 700 block for example was cleared in 1956. Today, as we saw in an earlier post the even side of the 900 block of Hornby is part of Arthur Erickson’s Law Courts, now almost disappearing in summer behind Cornelia Oberlander’s tiered landscaping, and now also featuring the Hornby Street bike lanes. We thought this was the last building that we had been able to identify that English investor Harvey Hadden built in the city. Unlike the other three that were on Hastings Street, this was on Pender Street, and was appropriately called Pender Chambers. And unlike the others, it appeared to have lasted quite a bit longer. It was reported to have been designed in 1895 by W T Dalton soon after S M Eveleigh had joined as a draftsman (although the partnership between them was only formalised in 1902). The building on the site was still standing in 1974 when this image was taken. The second floor was occupied by the Duffus School of business (which it had been for around 25 years). We saw the earlier premises occupied by the school in an earlier post. On the main floor was the White Rose Cafe, a Chinese restaurant, the Vancouver Coin and Stamps Co, and Wilson and Kofeod’s real estate and Insurance agency. The problem we have is that there’s no building on this site on the 1901 insurance map – or in the street directories. In 1905 there seems to have been a house with Mary Casher, a widow living downstairs, Thomas Slaughter and Martin Goodenham at the rear and a miner, a longshoreman and a carpenter elsewhere in the building. Pender Chambers don’t appear until 1907 when several real estate agents, a barrister and the Capilano Flume Co had offices upstairs. All eight offices had different tenants just one year later, including architect Henry B Watson, shipping agents, an osteopath and the Swayne Copper Mining Co among others. The main floor also seems to have been exclusively office uses. Whether this is Hadden’s building, designed by Dalton (and maybe Eveleigh) we can’t be sure. It has the same name – Pender Chambers – and Hadden continued to have an active interest in the city, so it is quite possible he only finally got round to developing the site many years after he had the initial plans drawn up. The stores and office tenants have, as with most Vancouver buildings, changed many times over the years. In the 1950s the Lion Cafe, Pender Shoe Renew and Lennie’s Luggage and another real estate company, Spencer Busch and Co were here. A decade earlier the cafe was Ford’s cafe, there was a tobacco store and the Art Engraving Co. The upper floor had a wholesale woolen merchant, a jewellery manufacturer, a tailor and the offices of the Amalgamated Civil Servants. In 1930 several units were empty, but the cafe was the Waldorf and Keir and Doig had a tailors store, with their workshop upstairs. The site was redeveloped in 1990 as a parkade – one of the last to be built in the Downtown area.